Located in the Sandhills region of North Carolina, Hoke is a rapidly growing county that boats a strong military population associated with Fort Bragg and the surrounding area. 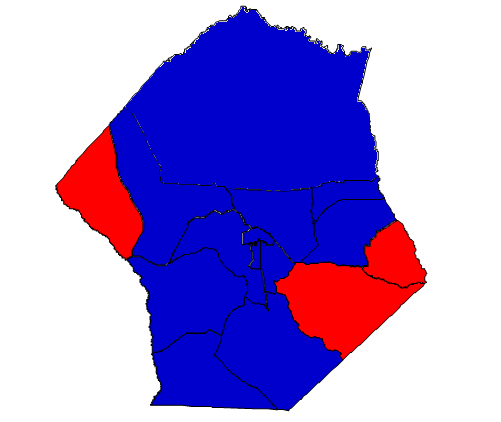 It was one of the last counties in the state to be founded, in 1911, formed from parts of Cumberland and Robeson counties. The county seat is Raeford and it is part of the Fayetteville metropolitan area. For most of its existence, Hoke was indistinguishable from many of its neighboring counties on the South Carolina border – small, rural, and poor, with a high population of non-whites. Presently, 38% of the population is African American, while 11% is Native American. But the county is changing. The 2000s decade yielded a high growth rate of nearly 40%. Recently released figures reveal that Hoke County is the fastest growing county in North Carolina and one of the fastest growing in the entire nation. This growth can be attributed almost entirely to an influx of military personnel; the county has become a suburb of Fort Bragg and an attractive area for young families. Given Hoke’s minority white population, its heavily Democratic affiliation should not be surprising. Democrats hold a strong 31 point edge over Republicans in terms of voter registration, and whites compose only 46% of registered voters in the county. Forecast: Hoke has always been a solidly Democratic county. But many of these Democrats were conservative white voters who became disenchanted with the national Democratic Party, and gradually they started voting for Republicans, especially at the federal level. But these white voters were heavily outnumbered by Democrat-voting minorities. In 2004, George W. Bush came within 5 points of carrying the county; his opponent John Kerry severely underperformed in Hoke due to a negative reception among military voters that can be attributed to the Swift Boat attacks. But this Republican trend quickly reversed itself: President Obama’s candidacy energized African American voters, and a massive voter registration effort helped Democrats. The vast growth in the county has failed to make a dent on Hoke’s strong Democratic tendencies. Although there is a stereotype that military members tend to be strongly Republican, there is no evidence of a Republican trend in the county. In fact, Hoke was one of the few counties where President Obama improved on his 2008 performance. This can be attributed to a high African American population that was heavily motivated to reelect the President. Still, the white population is growing at a stronger rate than the black population, and Hoke is even whiter than it was in 2000. It is possible that those in the military are more likely to back incumbents, which would have given an advantage to the President in 2012. The strongest growth, however, comes from Hispanics, who now compose 12% of the population. It is too soon to say whether or not this growth will ultimately benefit one party over the other, or even if this growth can be maintained. Still, Hoke bears watching. Later, we will be conducting a precinct-by-precinct analysis of many key counties, which will hopefully yield some information as to the political loyalties of new residents in Hoke County and elsewhere. Stay tuned.